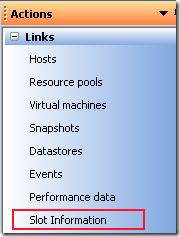 Do you have HA enabled cluster ? If you do then you will need to know what a slot size is, that’s if you don’t already, if you do already then just cut straight to the cool PowerCLI example…. I’m not going to explain this completely as I could never write such an excellent explanation as Duncan over at Yellow bricks, I highly recommend reading this post as it is pure excellence. So what is a slot size ? If you have a HA enabled cluster and have set the admission control to ‘Prevent VMs from being powered on if they violate availability constraints’, this means when your cluster does not have enough room to start VMs if a host fails then you will violate the constraints of the cluster and vCenter will not allow you to power on your next VM, but how does it know when you do not have enough room for another VM to power on ? Enter slot’s, a slot is measurement, the measurement is made up of a CPU Mhz reservation and Memory reservation, if there is no reservation a default of 256Mhz will be used for the CPU and the for the memory the memory overhead will be used, to make sure the cluster has enough room it will always look for a worst case CPU reservation and a worst case memory reservation scenario, so if you have a number of VMs in the cluster vCenter will base your slot size on the worst case MHZ and MB you have, if you have 50 x 2Ghz reserved, 4GB reserved web servers and 1 x 4Ghz reserved, 3GB reserved SQL server the slot size will be based on 4Ghz and 4GB, and how many of these can be fit into the cluster. It depends on your thoughts as to whether you think this is a good way of working this out or if this not, would you base it on an average CPU and memory across all of your VM’s ? Personally I can see why VMware have done this as they need to know that the VMs will have enough room to power on if there is a host failure. Don’t forget, if you think you know better then you can change the advanced configuration for VMware HA by following this guide. Again, I highly recommend reading both Duncan’s HA Deep Dive post and his recent slot size post as I have just touched on the subject (and missed all the main details). 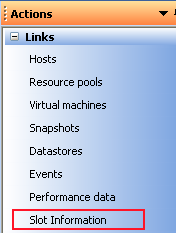 So anyway, where does PowerCLI fit in ? 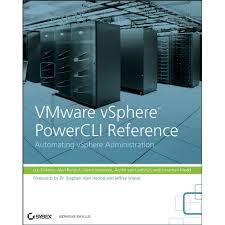 Please note that this information unfortunately is not in the 3.5 API so this code will only work on vSphere. So what if you use the VESI ? Keep an eye out on my site for more VESI integrations, expanding the already amazing product into further regions. Thanks Alan, I wasn’t aware of the .RetrieveDasAdvancedRuntimeInfo() function from the cluster. But now that I am, I will explore. I would also say that but it isn’t the script which is wrong as all it does is display the information from vCenter. Can you provide an update for the latest powercli – it seems that this command may be out of date or maybe I am doing something wrong? This would be really useful to run in our lab for testing purposes. Carlo, thanks very much, I have just uploaded a different version if you want to re-download and try it. Thanks ! Thanks, blumin blog formatting ! I agree I wish it was there on 3.5 as well. Awesome, thanks! Just wish this would work on ESX 3.5 too.